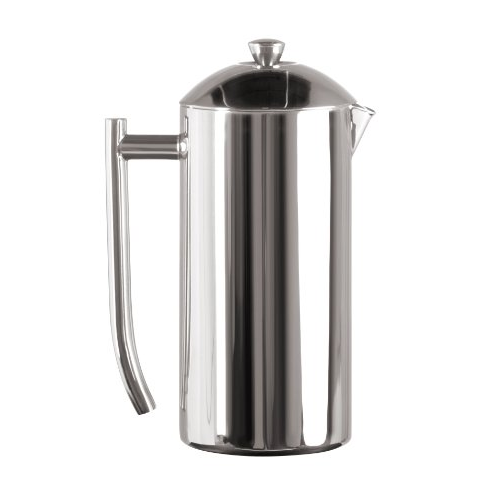 Anyone who is looking for a batter way to brew fresh, rich tasting coffee will love a stainless steel french press. 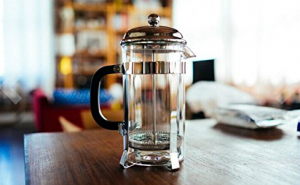 French press gives you the ability to brew thicker and more flavorful coffee. The stainless steel looks attractive in any kitchen and is durable. Simple to use and easy to clean, stainless steel french press is a great gift for any coffee lover. Making the best tasting coffee is easy now with the SterlingPro Double Wall Stainless Steel French Coffee Press. 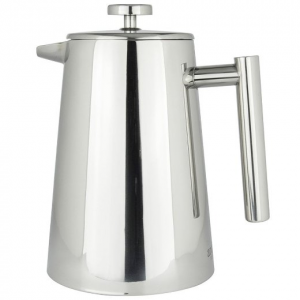 This french coffee press features stainless steel (18/10) interior and exterior that won’t rust and dishwasher safe. The double screens system removes all grounds from your coffee for an amazingly smooth cup of coffee every time. Thanks to its double wall construction, the unit will keeps coffee or tea warm longer and the outside cool to the touch. Great for any coffee lover. Do you want to enjoy amazingly delicious home brewed coffee? 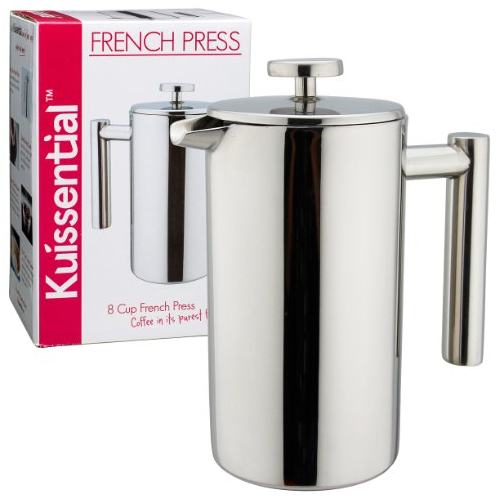 If yes, you cannot miss the Kuissential 8-Cup Stainless Steel French Press. 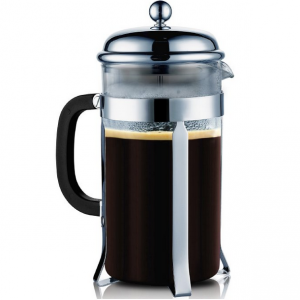 This french press features double walled stainless steel design that will hold optimal brewing temperature (195-205F). The stainless steel is also durable and you don’t need to worry about shattering when dropped like glass. Comes with stainless steel plunger and filter. Tired of the glass french press that cracks easily? Want something more sturdy? Well, look no further. 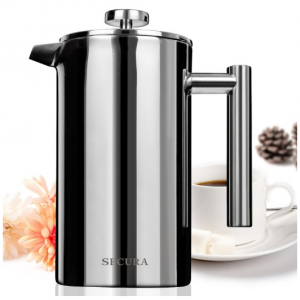 The Secura Stainless Steel French Press is made from top quality 18/10 stainless steel, both the interior and exterior, for durability. The 3-layered Stainless steel filter construction traps the smallest coffee grounds to ensure an exceptional full-bodied flavor. Cool touch handle and knob for comfortable and safe pouring. 34 ounce/ 1000ml capacity. Want to make coffee like the pro? Now you can with the Elementi French Press. This 18/10 high grade stainless steel french press features premium fine mesh filter that gives you a clean cup of coffee every time without coffee grounds in your cup. The double wall, stainless steel insulation keeps your coffee hot for up to 40 minutes after brewing. Also includes coffee scoop (1.5 Tbsp) that allows you to accurately measure. Dishwasher safe for easy cleaning. Enjoy fresh, rich tasting coffee with the Frieling Polished 18/10 Stainless Steel French Press. The unit is double wall insulated to retain heat four times longer than a glass press. It features all-steel mesh plunger that easily pushes down coarse coffee grounds or loose tea leaves. The full-length handle is comfortable to grip. Disassembles easily and dishwasher safe so cleanup is a snap. Perfect for everyday use.